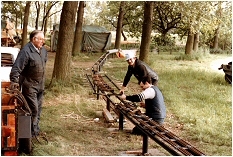 build the track an extension to the lease was negotiated, but in 1984 rumours indicated that the lease would not be renewed and the Cannock park track finally closed in 1986. 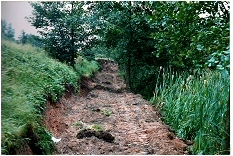 The area was later developed into a golf course. Members would not be able to run their locomotives again until 1990. Member Geoff Shackleton worked at the Rugeley Power Station and he thought it might be possible to have a railway in the grounds of the power station. He asked the station manager and he agreed that providing there would be enough members of the power station staff interested they could form a section of the power station social club. It would have to be called the Rugeley Power Station Society of Model Engineers. Notices were posted in the 'A' and 'B' power stations to try to attract interest. Sufficient people were interested and the section was formed in 1987. Derek Moore also worked at the power station and he and Geoff set about obtaining the materials and organising the building of the track and buildings. 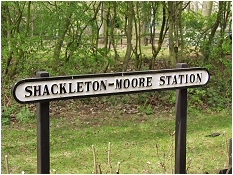 Shackleton-Moore station was named in recognition of their work in establishing the club, the facilities, and the track. The track was originally going to be a straight one running alongside one of the power station roadways, but then they were offered the present site because it was in a poor state and in need of regeneration. A tremendous amount of work was put into building the track which was designed to be 2000 feet in length. It was available for running in 1990 and was officially opened in August 1991. 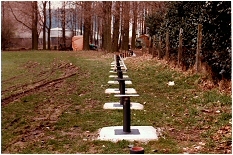 Since 1991 the facilities have continued to be developed and expanded. 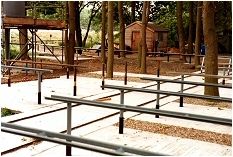 The society has hosted the Midlands Federation Rally in 1991 and again in 2011. Sadly, following the closure of the Rugeley Power Station, our society will no longer have the use of our existing track and facilities and will close down, effective 1st April 2017.